Although we're neatly ensconced in our hotel room in anticipation of the St. George Family History Expo this weekend, we won't miss Friday night's Who Do You Think You Are? Season 2 Episode 4 featuring Golden Globe winner Kim Cattrall as she climbs her family tree. (Great run-on sentence, huh?) Kim is hoping to solve the mystery of her grandfather's disappearance 70 years ago. Visit www.nbc.com/who-do-you-think-you-are for a preview. Betty White uses Twitter. Entire national goverments have been overthrown using Twitter. Better find out what Twitter is all about. If you are new to Twitter, here's help. Here hostesses Angela, Selma and Valencia will open the doors in the "~WDYTYA" chat room for typed discussions during the show beginning with the Eastern US time zone NBC broadcast. These gals have been rocking genealogy chats since the old AOL Genealogy Forum days, and they really know their stuff! I"ll definitely be there! Thomas Macentee has recovered his voice, and is back in the saddle again hosting this week's GeneaBloggers Radio show. Turn up those computer speakers, or better yet, use your headset. Call-in participants may use Skype or phone. Our Golden Boy of Radio, writes "Join us for another episode of GeneaBloggers Radio on Friday, February 25, 2011 starting at 10pm EST, 9pm CST, 8pm MST and 7pm PST! 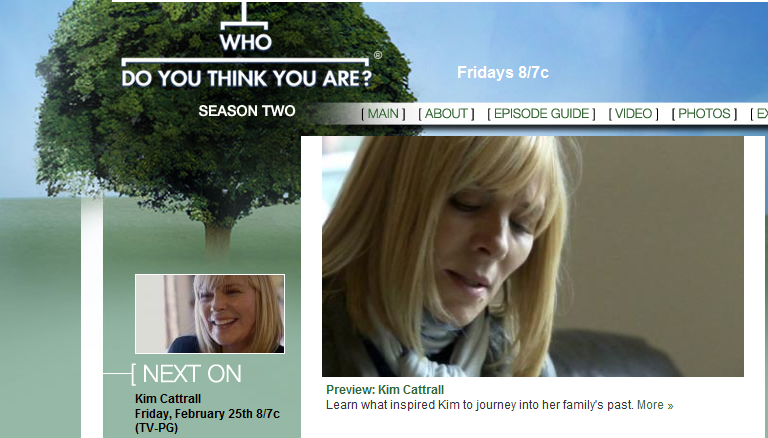 This week we'll be discussing the Kim Cattrall episode of Who Do You Think You Are? on NBC. You can call in and share your thoughts with the rest of the genealogy community or you can participate in our online chat! In addition to WDYTYA, we'll be discussing the role of technology in the genealogy industry, the recent explosion of genealogy webinars and what it means for genealogy education, and much, much more. And this week we'll have special door prizes to give away! Stay tuned! GeneaBloggers Radio is about the most fun you can have with your genealogy on a Friday night!" To find that chat "room" when listening to Thomas at http://tinyurl.com/4obhtgv , just scroll down the page, and you'll see the room list, and typed commentary as it happens. Feel free to jump in with your thoughts! Wild horses couldn't keep me away.